“There Is a Balm in Gilead” is an African-American spiritual that compares the healing balm to the saving power of Jesus—the one true treatment that never fails to heal our spiritual wounds. There’s power enough in heaven, To cure a sin-sick soul. A balm is an aromatic, medicinal substance derived from plants. Gilead was an area east of the Jordan River, well known for its spices and ointments. 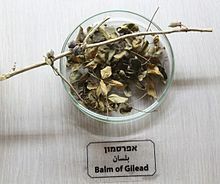 The “balm of Gilead” was, therefore, a high-quality ointment with healing properties. The balm was made from resin taken from a flowering plant in the Middle East, although the exact species is unknown. It was also called the “balsam of Mecca.” Myrrh is taken from a similar plant—Commiphora myrrha. The Bible uses the term “balm of Gilead” metaphorically as an example of something with healing or soothing powers. Some times something has happened in our lives that has knocked us back and from which we have been unable to rise above, or get totally free from. When we are afflicted by a wounded spirit we are unable to step out boldly to obey the Holy Spirit, and therefore so much of God’s purposes for us are lost in our inability to release faith in a consistent manner. The subject of a wounded spirit is an important one, as it affects so many people. Many don’t even understand what it is, or how it affects us. We can endure all kinds of physical illness, but when our spirit is wounded – and a wounded-spirited person is someone who has been hurt and bruised and/or damaged in their spirit – it can be very painful. A wounded spirit comes as a result of a re-action to negative words, events, actions, or a violation of your person or rights – a re-action that crushes you, knocks you down and from which you cannot seem to rise. It crushes an area of your life – your spirit – which is quite devastating in how it affects us. It seems we cannot heal ourselves of a wounded spirit. We need someone else to release it in positive, believing prayer. Severed Soul/ Abuse and Ritualistic Abuse – The person can develop what is known by medical professionals as Schizophrenia, Bipolar or Split personality disorder. Mental illnesses are formed from severe traumas when they are bestowed upon individuals. What is interesting though is how families can suffer with the same mental illness and not be inflicted with the same severe traumas. Never Being Good Enough/ Fractured Soul – The word fracture means broken. When people reject us or criticise us this creates a wound. We need to forgive ourselves for not meeting the expectations that are put upon us. Shattered Soul/ Dissociative Identity Disorder -THIS IS MY LOVED ONE. According to Wikipedia DID is a mental disorder characterized by at least two distinct and relatively enduring identities or dissociated personality states that alternately control a person’s behavior. Symptoms range from common lapses in attention, becoming distracted by something else, and daydreaming, to pathological dissociative disorders such as psychosis. A psychotic break according to Wiki is someone who loses contact with reality. Symptoms can range from harmless delusions, to violent outbursts and major depression. The sufferer may also be unable to distinguish reality from fantasy. Traumas fragment the soul. DID is when the whole soul shatters and breaks. It is the worst kind of damage. People with this disorder can never repair themselves – there is no reparation outside of Jesus. Man can pick up the pieces with drugs, occult means and self-help measures but this only repairs with glue. Jesus wants to not only repair but make whole and brand new. How does this happen? Continual abuse until the soul can no longer protect itself. It can be through trauma, rejection, violence, abuse. It is all things combined until one breaks. DID is not one particular thing but many. In DID the soul has spit the dummy. It can no longer function. Everything breaks down. The physical body needs the soul to survive. The spirit/soul and body are intertwined. Like a well-oiled machine when one is out it affects everything as a whole. For Jesus to heal this disorder you need to forgive and bless those who have wronged you. I found these listed on a website “The Christian Connection.” It was very interesting to read and more in depth than I reposted here. You may want to read more and say the prayers that go along with these. I stand in the gap for my child. Knowing that a belief in God is not there for her will not deter me from being the bridge. So when I was in church today with my husband and an anointing was offered for the oil of healing I stood in her place. To be completely honest here, I really wanted to go twice! Once for me and once for her. I know I suffer too from a wounded soul. This week I will pray for the wounded souls, mine and those I love. Join me. This entry was posted in Uncategorized and tagged balm in Gilead, healing spiritual wounds, mental illness, NAMI, praying for others, stand in the gap. Bookmark the permalink. ← Calgon, Take Me Away!! !